Without trust, cooperation breaks down, financing breaks down and investment stops. One can bomb a country back to the Stone Age, destroy much of its human capital, and eliminate its political institution. But, if trust persists, the country may be able to right itself in just a few years, as in Germany and Japan after World War II. Conversely, you can endow a country with all the greatest natural resources but if there is no trust, there is no progress. As businesses launched what BusinessWeek referred to as the “Great Trust Offensive” to regain lost trust and reputation in a bid to win back consumer confidence, one question remained unanswered: are there forces in the economy that facilitate the natural rebuilding of trust and reputation? This article argues that disclosure is one such force that provides opportunities for building managerial reputation. We will examine these forces at a very basic level, that is, the level of economic transactions since a multiplicity of these transactions builds the momentum of economic activity, which then translates into economic development. Trust is widely accepted as a necessary condition for virtually every economic transaction. We focus here on the transaction of exchange inherent in investment, because at the heart of a multitude of economic transactions of varying degrees of complexity is this simple exchange between two parties. One of the parties to the exchange has resources that he entrusts to the other party. The other party has the ability or the technology to multiply those resources. Implicit in this exchange is the risk borne by the first party that the second party may return nothing to him. Given the incompleteness of contracts, such risk brings the importance of trust into sharper relief. The nascence of enforcing institutions in emerging economies further underscores its importance. We will use the above basic framework of economic exchange to explore the role of disclosure and fi nancial reporting in improving trust, facilitating reputation building and stimulating investment. Consider the following economic transaction (Scenario A below). Consider the following economic transaction (Scenario A below). An investor has “m” units of wealth to invest. A manager has patented technology because of which he is able to triple any investment in him. The investor chooses to invest in the manager expecting that the manager will return a fair proportion of the tripled amount to the investor. Note that once the investment has occurred, the manager is under no obligation to return anything to the investor. As a matter of fact, standard game theory predicts that the manager, acting in his own best interest, will not return anything, and consequently, the investor anticipating a zero return will not invest anything. However, there is overwhelming evidence in experimental economics (e.g. Berg et al., 1995) that the manager returns non-zero amounts, thereby inducing non-zero investments from the investor. In other words, the investor puts his trust in the manager and the manager reciprocates such trust. Now, consider a scenario where the above one-shot game is repeated twice (Scenario B). At the end of the first period, the manager makes a return decision. And then again, at the end of the second period, the manager makes a return decision. The amount the manager returns in the fi rst period of a two-period game is greater than the amount the manager returns in a one-shot game. This is so because now the return decision is motivated not only by reciprocity but also by reputation building. The manager tries to build a reputation for being trustworthy so that the investor invests in him in the second period. So far, there is no information asymmetry between the manager and the investor, in the sense that the manager knows that the investor is endowed with “m” units of wealth, and the investor knows that the manager is endowed with production technology that allows him to triple the investment in him. Both of them see whether the investor invests and how much the manager returns to the investor as dividend. Now, replace the deterministic technology by a risky/ uncertain one (Lunawat et al., 2014). 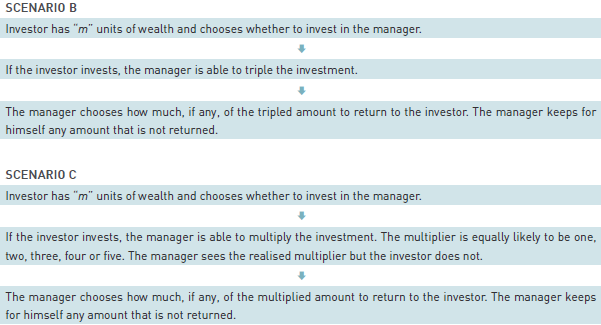 Suppose that the investment in the manager gets multiplied by a risky/ uncertain multiplier instead of a multiplier of three (Scenario C). Suppose further that in each period, the multiplier is equally likely to be one, two, three, four or five. The manager always sees the realised multiplier but the investor does not. Since the investor does not see the realised value of the multiplier, the manager can hide behind the possibility of a low realisation. For example, suppose that the investor chooses to invest in period one. Suppose further that a multiplier of four is realised so that the manager receives “4m”. Let us say there is an evolved norm that a truthful manager returns half of what he receives. A truthful manager would, therefore, always return “2m”. However, a manager that acts in pure self-interest will return “m/2”, thereby implying to the investor that no multiplication occurred (or, equivalently, a multiplier of one occurred). Such information asymmetry has consequences for an investor’s beliefs about the manager’s trustworthiness. For example, let’s say that at the beginning of period one, the investor believes that there is a 70% chance that the manager is truthful and trustworthy, in other words, that there a 70% chance that the manager will return to the investor half of what he receives. Now, if at the end of the first period, the investor sees a return of “m/2”, he knows that one of the following two things might have happened. One, the manager is truthful but a multiplier of one was realised. Two, a multiplier greater than one was realised, but the manager is untruthful and is trying to imply that a multiplier of one was realised. Since there is a positive probability that the manager is untruthful, the investor, therefore, upon seeing a return of “m/2”, will revise his beliefs about the manager’s trustworthiness downwards. That is, at the end of period one, the investor believes that there is a less than 70% chance of the manager being truthful. The downward revision of beliefs has a dampening effect on investment in the economy. Suppose the investor has an investment strategy whereby he invests only if he believes that there is at least a 70% chance that the manager is truthful. Now, in the second period, the investor believes that there is a less than 70% chance that the manager is truthful, hence, he will not invest. This issue can be resolved by introducing the possibility of financial reporting (Lunawat 2013a). In this situation (Scenario D), financial reporting will take the form of the manager disclosing to the investor his private information about the realised value of the multiplier. Now, the manager is unable to hide behind a possible low realisation of the multiplier. The manager, even though acting in his own self interest, is forced to a return fair dividend to the investor. Financial reporting, in this scenario, disciplines the actions of the self-interested manager. In the process, financial reporting facilitates a self-interested manager’s efforts at building a reputation for being trustworthy and also stimulates investment. However, there are constraints to how far financial reporting can go. Suppose that there is a 100% chance that the self-interested manager will pretend to be truthful. Then, a fair dividend does not allow the investor to distinguish between a truthful and a self-interested manager. Consequently, if at the beginning of the fi rst period, the investor believes that there is a 70% chance that the manager is truthful, then at the end of the fi rst period, too, the investor believes that there is a 70% chance that the manager is truthful. Suppose further that the investor has the following investment strategy. The investor invests in the fi rst period if there is at least a 60% chance that the manager is truthful and the investor invests in the second period if there is at least a 75% chance that the manager is truthful. Since in the second period, the manager believes that there is only a 70% chance of the manager being truthful, the investor, therefore, will not invest in the second period. The above can be improved upon if the self-interested manager chooses to be truthful in less than 100% of the cases. The intuition at play here is subtle. If there is a less than perfect chance of the self-interested manager returning a fair dividend, then a fair dividend becomes more informative. While earlier a fair dividend conveyed nothing to the investor about the truthfulness of the manager, a fair dividend now conveys that there is a greater than 70% chance of that particular manager being truthful. That is, it allows the investor to update his beliefs about the truthfulness of the manager at the end of period one. The self-interested manager, on his part, can choose to be truthful with a probability that is just enough to make the investor believe that there is a 75% chance that the manager is truthful. The investor, too, on his part, can choose to invest in period two with a probability that makes the self-interested manager indifferent to either appearing or not appearing to be a truthful type. In summary, there is a greater than zero but less than 100% chance that the self-interested manager pays a fair dividend in the fi rst period and the investor invests in the second period. Overall, disclosure accomplishes an improvement in investment and this is corroborated by experimental data (Lunawat, 2013b). The following graph shows data from a laboratory experiment with human subjects (Lunawat et al., 2014). The subjects were mostly students and the experiment was run at a research centre in Montréal, Canada. Half of the subjects were assigned the role of an investor while the other half were assigned the role of a manager. The investors were endowed with 10 units of experimental currency units and chose how much, if any, to invest in the manager they were paired with. The managers made a return decision, as described earlier. In some sessions of the experiment, the managers had the option to truthfully disclose their private information to the investor, and in the other sessions, they did not have any such option. 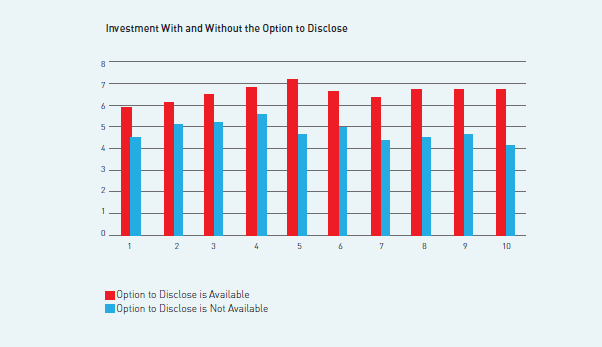 The average investment without the option to disclose is 4.77 experimental currency units, which jumps up to 6.53 experimental currency units once the option to disclose is introduced. The above discussion has focussed on the relationship between trust, reputation and disclosure in economic exchange. Given the perniciousness and repeat occurrences of financial scandals, the innate role disclosure plays in building and repairing trust provides a window of opportunity for instituting and regaining investor confidence. While this article focusses on the economic institutions of disclosure and financial reporting, a more general understanding of the role of other economic institutions in fostering trust and building reputation (and vice versa) will improve our understanding of how fundamental forces shape the development of our economic institutions. For example, there is recent work that sheds light on how the economic institution of record keeping altered the trajectory of economic development (Basu and Waymire, 2006; Basu et al., 2009). A better understanding of the mutual interdependence of trust and reputation on the one hand and economic institutions on the other hand can only help us in fostering economic development. Basu, S., and G. Waymire. 2006. Recordkeeping and Human Evolution. Accounting Horizons 20 (3): 201–229. Basu, S., J. Dickhaut, G. Hecht, K. Towry, and G. Waymire. 2009. Record keeping Alters Economic History by Promoting Reciprocity. Proceedings of the National Academy of Sciences 106: 1009–1014. Berg, J. J. Dickhaut, and K. McCabe, 1995. Trust, reciprocity, and social history. Games and Economic Behavior 10: 122-142. Lunawat, R. 2013 (a). The Role of Information in Building Reputation in an Investment/Trust Game. European Accounting Review 22.3 (2013): 513-532. Lunawat, R. 2013 (b). An Experimental Investigation of Reputation Effects of Disclosure in an Investment/Trust Game.” Journal of Economic Behavior & Organization 94 (2013): 130-144. Lunawat,R., G. Waymire, and B. Xin. 2014. A Glimpse Behind the Curtain That Conceals Self-Dealing. Working paper. Sapienza, P., and L. Zingales. 2009. Anti-Trust America – A Trust Defi cit is Driving our Economy Down. City Journal, 27th Feb, 2009. 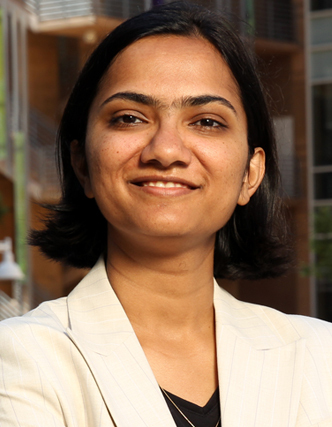 Radhika Lunawat is an Assistant Professor at The Paul Merage School of Business at the University of California, Irvine, California.